The forecast wasn’t good. While speculation abounded in the press that Roman Abramovich had brought him in to mentor the misfiring Fernando Torres, analysis of Benitez’ first sixteen games in charge cheerily revealed his record was worse than that of Andre Villas-Boas; a man whose inability to control the salty sea dogs in Chelsea’s hold saw him walk the plank a mere 256 days after being handed his uniform. Rumours of ‘crisis talks’ and ‘bust ups’, insulting banners and abuse followed Rafa like feral hounds but rather than allow them to take chunks from his plump calves until he was forced to drop to his knees, he turned and screamed at them until their only choice was to slink off into the shadows. Since then, slowly but surely, Benitez has steered Chelsea through the treacherous ice field and into clearer waters. Somehow he’s convinced the crew, particularly old hands Terry, Lampard and Cole, to consign their respective beefs to the bilge, at least while the battle for honours heads towards it’s denouement. As for afterwards? 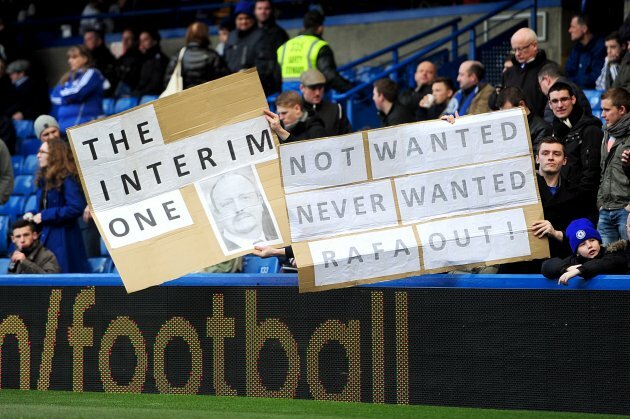 Why should Benitez care? As he pointed out himself, he’ll have sailed happily into the sunset by that point, able to watch the distress flares rise into the sky above Stamford Bridge from a safe and comfortable distance. For now, Chelsea are ninety minutes away from their second final in Europe in two years, remain firmly in contention for third place in the table and only just lost out to Manchester City for a place in the FA Cup Final. While Fernando is still not really firing, the contemplative Spaniard has found the will to fight for his place on the front line, while Benitez’ decision to allow David Luiz the freedom to maraud up the flanks is starting to look inspired – the self-styled Brazilian geezer has scored some important goals in recent weeks, none more so than the stoppage time winner at Basel last Thursday. If the boys in blue do make it to the Europa League final and win it, who will be waiting to welcome them when they return to port? Will the hounds, whose barking and bitching has been notable by it’s absence while the battles have been fought and won, hang their heads as an admission of their mistake? Will they learn from the experience and support the next man to lead their men? It’s unlikely. They’re Chelsea through and through and will defend it’s honour to the death, preferring to go down with a sinking ship rather than see it helmed by someone they deem to be unsuitable. Rafa can tell you that. As a strong Chelsea fan I can attest that your knowledge on Chelsea FC is a bit shaky and suspect for starters , “while Benitez’ decision to allow David Luiz the freedom to maraud up the flanks is starting to look inspired” is a statement that is totally inaccurate.David Luiz still plays the majority of his games as a center back and even when he moves up front he does not “maraud up the flanks” as he plays the position of a holding midfielder and not as a winger. Sorry But your usage of a metaphor to suggest that Rafa benitez is a captain that has steered a sinking ship into safety is also erroneous , when he took over from RDM ( there’s only one) Chelsea were 4 points behind Manchester United and now 17 points behind ,does that not epitomize a sunk ship?With the squad Chelsea players have got I expect them to be competing for the top spot and not for fourth , so given credit to Rafa for loosely hanging on to the top 4 which is not even guaranteed and an almost Europa league final berth is a bit porous to be extolling (at least at the moment).